I’m typing this as our temperature outside drops to start with a “4” and it.is.awesome. It just wasn’t right to have Christmas lights up and be holiday shopping when it’s 81 degrees outside, even if it is south Texas, so now it definitely feels more like the holidays! All those Black Friday boxes are rolling in (sorry UPS guy!) and our tree finally has some wrapped gifts under it. I have no idea how they’re all going to fit under it this year because a certain baby is apparently receiving an entire Babies R Us it looks like! I’m sharing some of my latest finds for the last First Week Favorites of 2017, and it may be one of my favorites because there’s something in it that I’ve been waiting for for over 8 years now, eeeee!!!! THIS y’all, THIS!! If you’ve been around here for a while, you’ve seen that we’ve replaced almost all the fans and light fixtures in our home but there’s one that remains, and unfortunately the ugly thing resides in our living room. We must still have a ceiling fan (#Texas) but finding one that works in our style with the options we need was harder than I expected. Nautical/coastal look, five blades, bronze finish, remote control, reverse on the remote, and bright lights…phew! Well, enough is enough and I’m happy to say I finally found the PERFECT fan for our space!!! 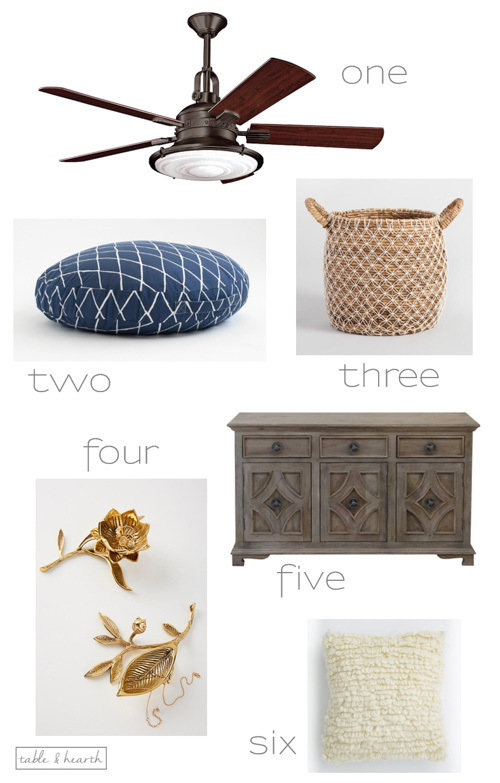 Kichler has a ton of fans in line with the style I wanted and I ended up going with the Kittery Point from Lamps Plus. This beautiful thing is on it’s way as I type to finally complete our living room. I’ll be posting about it as soon as it’s up, so stay tuned!! If I had known how comfy a floor pillow can be after the umpteenth hour playing with the baby on the floor I would have totally put one on our registry. I was stoked when I saw that Minted carries them in some of their independent artist designs, its one of my favorite places to snag beautiful fabric pieces. So a big poofy spot to be baby’s playground in a pretty design is a total score. Two favorites in one piece, macrame and seagrass! 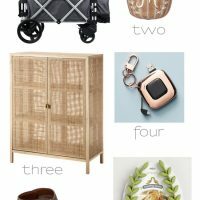 This would work well in all sorts of spaces; boho, modern, coastal, and even farmhouse…I think it would be a great option for containing the little guy’s ever growing toy stash in the nursery. 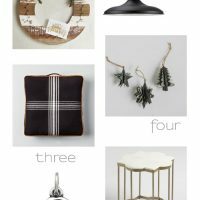 Anthro always has the most beautiful and unique gift ideas and I thought these were gorgeous. They’d be a perfect little present for your BFF, mom, sister, SIL, or wife, they’re just so so pretty! These may be the coziest of the cozy pillows, and every single color is beautiful. I think a couple of the ivory ones would look beautiful in our master bedroom, I’m really itching to update our pillow situation in there…although it rarely gets made these days, ha! Tune in next Wednesday for our December Monthly DIY Challenge and have a great weekend! !